I know people like to dream and Latvians are apparently no exception. Their latest collective dream, or at least, those of the elites that fancy wining and dining in style in Brussels, is to join the Eurozone. The Latvian government has now formally requested the EU to undertake a “Convergence Report assessment” of the Latvian economy to facilitate membership by January 2014. The opinion polls do not necessarily support the intent of the Government. But the conservatives are out in force with supporting narratives. One such attempt at making the impossible argument was from on Anders Aslund, who is one of Peter Peterson’s stooges and has co-written a book with the Latvian Prime Minister. He wrote a Bloomberg Op Ed (January 8, 2013) – Why Austerity Works and Stimulus Doesn’t – which turned out to be a major revision of all the known facts and concepts that almost everybody else (apart from the pro-austerity spivs and their hangers-on) would by now have to share. I made a few graphs. Fiscal austerity is bad. There are no qualifications. Mr Aslund seems to think that Greece has gone easy on its fiscal consolidation – with “half-hearted austerity or, worse, fiscal stimulus”. He thinks they have fallen prey to the “predominant Keynesian thinking” which “has been tested, and it has failed spectacularly”. News to me. 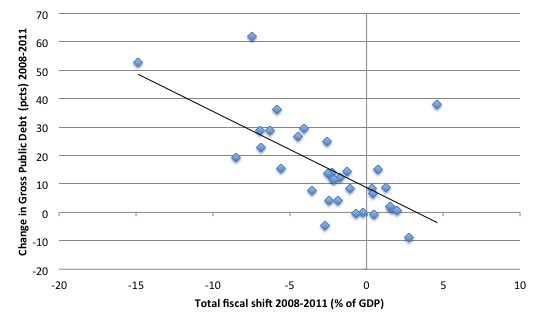 In the graphs below, Greece is the observation that is associated with the greatest fiscal shift. It has gone big – nothing “Keynesian” about it. Anyway, I have been putting together a database for sometime (since December 2012) and here are some graphs that might be of interest. The data comes from the – IMF Fiscal Monitor Database – and contains information on the shift in fiscal position for selected countries. The only complication with this dataset (see Figure 15 in the Fiscal Monitor) is that the revenue shift (between 2009-12) is expressed in terms of the proportion of GDP, whereas the expenditure shift is expressed in terms of Potential GDP. I can use output gap estimates to convert them both into the same GDP measure but I haven’t time today. So the total fiscal shift modelled here is a little mismatched and will understate the degree of overall shift because the expenditure side is expressed in terms of a larger denominator than the revenue side. So this should be interpreted as the best case scenario in an appalling set of circumstances. The GDP and public debt data series: the percentage change in real Gross domestic product 2008-2011, the percentage change in real Gross domestic product per capita 2008-2011, and the percentage point change in General government gross debt 2008-2011 – were constructed using the – IMF World Economic Outlook dataset – as at October 2012. I used the change for 2008-2011 because the recession really hadn’t started impacting until 2009 and the IMF figures for 2012 are still estimates. And, as you know, the IMF always inflates its growth estimates and downgrades its contraction estimates because then their recommendations of austerity do not seem to have as bad a consequences as actually turns out to be the case. The unemployment rate data comes from Eurostat’s standard labour force survey data. The variable I constructed was the change in the unemployment between 2009 and 2013. So real GDP growth and unemployment are real variables which measure prosperity. The proponents of fiscal austerity claimed that growth would return and the unemployment rate would fall if only austerity was imposed. There are all sorts of issues with endogeneity in this sort of exercise – that is, what is driving what. We expect the fiscal position to show a contraction when a nation is growing strongly because of the impact of the automatic stabilisers. But this dataset is the actual shift in the fiscal position over the period noted. 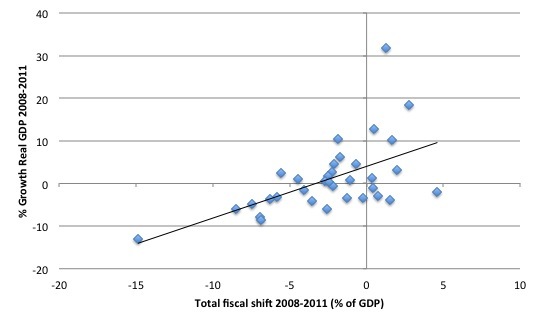 The first graph shows the relationship between the shift in fiscal position (negative is a contraction – that is, austerity) and real GDP growth over the period noted above. The relationship is very clear – austerity damages real GDP growth. 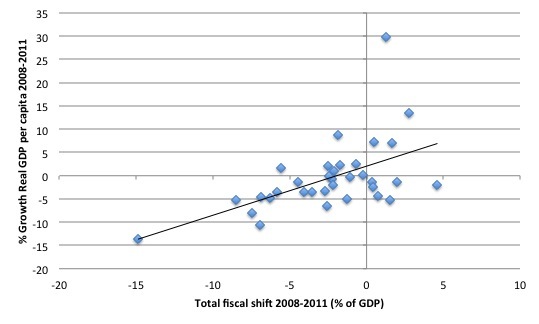 The second graph shows the relationship between the fiscal shift and the growth in real GDP per capita. Not much joy for the Austerians there. In general, the weight of evidence is that nations that undergo larger fiscal shifts make their population poorer on average. The third graph shows the relationship between the fiscal shift and the percentage point change in the unemployment rate. Note the dataset includes fewer nations given the Eurostat labour force coverage. Once again, there are no secrets here. Consistent with what happens to real output, the other side of the coin is that employment growth collapses when austerity is imposed and unemployment rises. Now, what has all this fiscal contraction been for? Some will say that this is the price that has to be paid for restoring budgetary orthodoxy. But is this so? 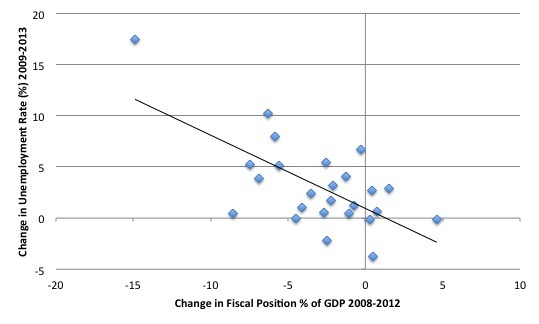 The more intense the austerity, the larger is the subsequent increase in the debt-to-GDP ratios. This is not really surprising … those countries that applied the strongest austerity also saw their GDP (the denominator in the debt ratio) decline most forcefully. Thus, it can be concluded that the sharp austerity measures that were imposed by market and policymakers’ panic not only produced deep recessions in the countries that were exposed to the medicine, but also that up to now this medicine did not work. In fact it led to even higher debt-to-GDP ratios, and undermined the capacity of these countries to continue to service the debt. Thus the liquidity crisis that started all this, risks degenerating into a solvency crisis. The following graph shows the relationship between the fiscal shift and the percentage point change in government debt ratios over the period noted. My analysis is over a longer period than that conducted by Paul De Grauwe and his associate (they used the period 2011-12). The data supports their finding. Fiscal contraction when the non-government sector is not inclined to fill the aggregate demand gap created by the deficit reduction does not even succeed in terms of the principle target – a reduction in the public debt ratio. Conclusion – the pro-austerity clan lie. I have had very little time today – full of meetings. So a quick blog to show you some of the characteristics of this dataset. I am doing more intense (econometric analysis) of it which is confirming the casual empiricism that we are engaging in here. Sometimes, simple eyeballing is misleading because there is complex causality. But in other cases, such as here, what you see is what is. Your eyes are not deceiving you. The correct stance for those who promote it is not to lie about the consequences but to tell their electorates etc the truth and then try to justify why they would want to damage and retard real GDP growth, render the population increasingly poorer, cause the jobless rate and related costs to rise, and, when it all comes down to it – increase the public debt ratio. That is the sort of narrative that would be interesting to hear. Of-course, these spivs know full well that if they told the truth there would be a total revolt in the streets and their chances of dining swell down in Brussels would evaporate. Bill, here in Europe there is a growing opposition to deficit spending policies coming from the proponents of the degrowth theory (Latouche). It is odd but in Italy for example the 5 Stars Movement (at the moment) is supporting public debt reduction from this point of view. What’s your opinion about it? Your argument is correct but your headline is wrong. There is one qualification: it depends on what condition the economy is in. When the economy reaches capacity, fiscal austerity is good. Even that is conditional. Austerity may be imposed by the automatic stabilisers, that is the tax revenue automatically generates a surplus when full capacity is reached meaning there is no need to tighten fiscal expenditures. However, I do not think this is the “austerity” that Bill Mitchell is referring to. The term “fiscal austerity” is a specific nomenclature that is associated with a deliberate pro-cyclical contraction in the government’s net position. It is a term that belongs in the neo-liberal era and is bandied about by the IMF and other conservative institutions. It is a term that is part of the myth that government net spending is damaging to the economy and inverse to non-government spending. The concept you are referring to is just normal sound fiscal management where the government was responsible for ensuring that the growth of effective (nominal) demand didn’t exceed the growth if the real capacity. We never called that counter-cyclical management “austerity”. Although I agree with you on the pernicious consequences of the frontloaded austerity recommendation by Aslund I wouldn’t write him off completely. His book on Latvia deserves at least a read (as well as his other books on the ex-communist countries transition which are excellent). The book is an excellent account of the political economy of that small country and if anything it is an incredible tale about how far a country will go to maintain a peg based on sovereignty (!) reasons. I would also recommend a book by another Peterson “stooge” which is firmly in the opposite camp: “Devaluing to Prosperity: Misaligned Currencies and Their Growth Consequences”. Is the procyclical association really intrinsic? Or is it just that there’s a lot more talk about it since the GFC, when there hasn’t been the opportunity for it to be anything but procyclical? You refer to the IMF and other neoliberal institutions. Did they never refer to fiscal austerity to address hyperinflationa. In Britain (before the GFC) the term “austerity” was mostly associated with the time following WW2 when there was a severe shortage of real resources. One thing MMT shows us is that when there’s a deficit it doesn’t mean there’s no need to loosen fiscal expenditures. Conversely when there’s a surplus it doesn’t mean there’s no need to tighten them. I’m curious of what you think the minimum wage should be in the United States? 10% of Latvia’s population packed their bags and left the country. That is one way to have austerity and reduce unemployment. The problem is much of those 20 something workers went to Ireland over the last 10 ~ years. They are now in their thirty something prime child bearing age group. Even many child poor Latvians have at least 1 kid. Irish birth rates have reached late 19th century highs with one quarter approx births coming from foreign born mothers creating a huge flux in the once Irish society. Unlike back then the energy density per person is decreasing today at a shocking rate with no boom time America or future Edwardian England around now. A closer study should be made of Irish GDP/GNP per capita decline rates. I imagine it is much higher then the Baltics given their population decline. The fat controllers are just loving these events to bits. Irish society no longer exists. A society that is no longer cohesive & thus atomized into containable units is unable to fight dark banking games. I am afraid its all part of the Euro Gue plan. The elite wanted to get rid of the Westphalian system of nation state bank control for the deeper control of market state experiment and indeed they have. They seek to strip all redundancy from former nation state & semi nation state systems. This is the way that US towns and cities deal with homelessness. Make so uncomfortable that the homeless will move on. In some places, the city will pay for the bus ticket. Inter consumption : 4,185 !!!! Value added at basic prices : just 760 !!!!!!!!!!!!!!!!!!! without subsidies Irish farming added a mere 760 million euros in Y2009 to the national economy. Irish farming obviously needs more labour inputs to reduce inter consumption. But the euro is far too hard a currency to pay labour. Its a shared capital token rather then state money token……………the machines will always come first. And so it is — here in the US we continue to hear nonsense that claims that if only we would cut government spending, prosperity will soon result (see Paul Ryan’s latest WSJ column which claims that ” a balanced budget will help the economy. Smaller deficits will keep interest rates low…”). Having been a devotee of MMT for only about two years thus far, Melia is curious – is this logic based on Ricardian Equivalence? Or is it just another example of the conservatives figuring they can tell tall tales and have the otherwise “left-wing biased” media cover their collective backsides? Talk radio personalities here love to refer to the “low information voters” who re-elected Barack Obama, but it sounds like they have plenty of those on their side as well.